We were thrilled to receive a lovely testimonial from one of our customers this week. “Garden Requisites. So, what’s in a name? Well, in this case the name is a misnomer really, for it brings to mind wheelbarrows, spades, watering cans …perhaps garden gnomes?… Not the beautifully designed and crafted metalwork sculptural features which complement our house wonderfully. Our first sortie with Garden Requisites was just after we had completed the major refurbishment of our lovely Victorian Villa, we needed some canopies, which they duly made and delivered. The quality was superb, and some 6-7 years later they still look good. 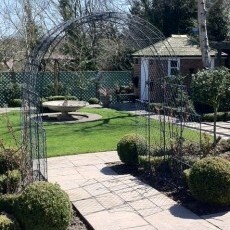 We were so pleased we started a collection – trellises, a large scooped canopy, a gate with trellis, a beautiful rose arch and a particularly interesting bespoke support for a mature wisteria which had come to earth after a storm, with or without its flowers it is a stunning architectural feature – much admired by all. For more customer reviews please visit our testimonials page.